Enslow's spring list includes a new series called Funny Bone Jokes. There are six titles in this series, covering animals, food, the body, holidays, sports, and science. Geared toward the elementary market, these jokes, limericks, fun facts, and tongue twisters will keep students entertained and wanting to read more. When Denzel Washington first went to college, he hoped to become a doctor. But he soon found he liked drama better than his science classes. This easy biography shows how Washington became one of the best-known movie actors in America, eventually winning two Academy Awards. Colorful illustrations, lively layout, and accessible vocabulary make the book ideal for early independent readers and useful for beginning reports. Stephenie Meyer is celebrating a birthday today. Lisa Rondinelli Albert's biography about Ms. Meyer is available. This 112-page title is great for middle school readers wanting to learn more about this author and her Twilight series of books. Thinking about getting a new pet for Christmas? If you are considering a pet for someone for Christmas, make sure you include reading material for that particular pet. Enslow has recently published a series, Beginning Pet Care with American Humane, on how to care for different types of pets. This series covers birds, cats, dogs, horses, fish, reptiles and amphibians, and small mammals. Written for the elementary reader, these titles are also reminders to adults of just what goes into caring for a new friend. The offices of Enslow Publishing, Inc. will be closed starting Friday, December 24 and will reopen on Monday, January 3, 2011. We would like to take this time to wish everyone a safe and happy holiday. We appreciate your business and look forward to doing business with you in the new year. Here are the common symptoms: rapid onset, usually in an hour or two; sudden and increasingly severe headache; sore throat and dry cough; rising fever that can reach 104 degrees Fahrenheit in adults and higher in children; sneezing and runny nose; muscle aches in the back, arms, and legs; loss of appetite; fatigue and lack of energy, sometimes for more than a week; severe chills, accompanied by feeling very hot, then very cold; occasionally, nausea and vomiting, especially in children. Got all that? Just thinking about it is more than enough. According to Investigating Influenza and Bird Flu, each year between 4 and 20 percent of the world population catches some form of influenza. In the United States, about 250,000 people contract the flu each year, and about 36,000 die from flu-related causes. After reading this, sounds like a good idea to get a flu shot! The holiday season includes anniversaries of important dates in American history. One of them is George Washington's bold crossing of the Delaware River during the Revolutionary War. His strong leadership and skillful tactics helped wavering colonial forces rally during a key period of the conflict. For teachers and media specialists planning to include Washington's crossing in December's American history lessons, an excellent resource to use is Enslow Publisher's George Washington Crosses the Delaware: Would You Risk the Revolution? Elaine Landau's 48-page book, part of the six-book "What Would You Do?" American history series, offers a unique, speculative approach to the Christmas Day battle. Each chapter concludes with the award-winning author asking readers to place themselves in the shoes of historical figures and articulating how they would have decided various courses of action. The structure thereby encourages the development of critical thinking skills in the context of an American history narrative. Full-color photographs and illustrations, as well as historical works, add visual support to the Guided Reading Level "O" text. The book also includes a useful timeline, a "words to know" section, and sources for further reading. A free, downloadable teacher's guide is also available on the Enslow Classroom paperback website -- http://www.enslowclassroom.com -- or at www.enslow.com. The paperback edition is available for $7.95; the library-bound version is available to qualifying schools and libraries for $17.95. Labels: classroom, elaine landau, Enslow Classroom, George Washington Crosses the Delaware, What Would You Do? Books for Teens is a program created by the American Library Association that helps to support teens who are at risk and empower them with knowledge from free age apporpriate books. Remember: Our Cash for Clunkers offer ends soon! Enslow is once again offering it's Cash for Clunkers offer, but it's only good until December 31, 2010. We wanted to send a quick reminder to those who are interested in taking advantage of it. Fans have been gathering outside of The Dakota, the apartment building in which John Lennon lived, as well as at Strawberry Fields, a memorial to Lennon located just inside Central Park across from The Dakota. Every year, fans gather and play/listen to John's music. His song "Imagine, " probably one of his best-known works, is a favorite. Enslow's book on John Lennon describes his childhood, his life as a Beatle, as well as his life as a solo artist. High school students will learn a lot about John Lennon from this book. The Centers for Disease Control and Prevention says keeping hands clean is one of the best ways to prevent the spread of infection and illness. Tips for hand washing are listed on their web site. Our title Super Ben's Dirty Hands, for Grades K-3, is a great way to introduce young readers to the importance of keeping hands clean which is especially important during this busy time of the year when all of us are more likely to be shopping in malls and exposed to large crowds. Bass guitarist for the band Def Leppard, Rick Savage is celebrating his 50th birthday today. This founding member is a vocalist, plays keyboards, and the synthesizer for the band as well. He is also an avid soccer fan. Interested in learning more about Def Leppard? Click here for the library bound version or here for the paperback version. New Jersey school librarians participating at this Friday and Saturday's NJASL Convention are invited to visit us at the Enslow Publishers booth. We'll be at Booth #30. We'll welcome you with fantastic, NJASL-exclusive deals, and provide hands-on opportunities to explore new Enslow series! The World Health Organization established World AIDS Day in 1988. World AIDS Campaign is the leading international organization which plans and implements the observance.Visit AIDS.gov for more information. The face of AIDS is changing. In 2005 in the United States, over 900,000 Americans were infected with HIV, and women accounted for about one-third of them. The important history, as well as the prevention, diagnosis, and treatment of the disease is presented in a clean style. Check out our title, The AIDS Update for grades 5-up. Rosa Parks refused to move to the back of the bus on this day, 55 years ago. This is a story I heard over and over as a child in school, but haven't revisited until now. Rosa Parks was 42 years old at the time when she got on a bus in Montgomery, Alabama. The bus driver demanded that she move to the back of the bus, to the black section, so a white passenger could have her seat. Parks refused and was arrested and convicted of disorderly conduct. Parks' event triggered Martin Luther King, Jr. to organize a 381-day boycott of the public transportation system in Montgomery. To learn about Rosa Parks, see Enslow's book: Rosa Parks: "Tired of Giving Up"
The holidays present teachers and parents with excellent opportunities to teach young children about money and the mathematical principles associated with the season. Enslow Publishers' six-book "I Like Money Math" series has the right stuff for older siblings, and adults need to teach and learn these fundamental concepts. Author Rebecca Wingard-Nelson's Guided Reading Level "K" text and clear examples provide an effective blend of language and content. Supporting illustrations lend each 24-page book essential, real-world visual context to the identification of coins and bills, as well as reinforcement of basic mathematical functions. One title in the series foucses on word problems, an area of particular significance for test preparation. Value-added features for this series include free, downloadable teacher's guides for each title, state and national curricular correlations, and free worksheets for most titles. Books are available in paperback via Enslow Classroom for $6.95 per copy; "six-packs" of individual titles in this series are available at 10% discount from Enslow's list price. For more information and immediate ordering, visit the Enslow Classroom website: http://www.enslowclassroom.com/. The series is also available in a library-bound format via http://www.enslow.com/. Madeleine L'Engle is a famous writer of fantasy for young people. Her best-known book, A Wrinkle in Time, has been loved by generations of readers and lauded by critics. Author Marilyn McClellan discusses L'Engle’s life and beliefs and analyzes two of her best known books. She also explores the history and present state of book censorship and helps readers form their own opinions about whether books should be banned. This blog entry was created and supposed to be posted on November 29, but did not get posted until November 30. The author of "The Chronicles of Narnia" would have celebrated his birthday today. Interested in learning more about C. S. Lewis? Click here. Congratulations to Jimmie Johnson who won his fifth consecutive Sprint Cup Championship. Visit Team Lowe's homepage for all the details. We know teens are crazy about cars and their driver's. Reluctant readers can learn more about Jimmie Johnson by reading his biography, Jimmie Johnson: Racing Champ. Enslow Publishers would like to wish everyone a HAPPY THANKSGIVING! Our offices will be closed, November 25th-26th. It's Thanksgiving weekend and besides enjoying the Thanksgiving Day Parade there will be plenty of football games to watch so today we thought it would be appropriate to feature two brand new football titles from our Top 10 Sports Stars series. Football's Top 10 Running Backs and Football's Top 10 Quarterbacks are both popular choices for football fans in grades 5–9. These color biographies cover the biggest names in sports, both past and present. With 48 pages, these titles are perfect for reluctant readers who like sports. Hip-hop star Kanye West, the subject of an Enslow Publishers biography, will be a featured performer during Macy's 84th annual Thanksgiving Day parade. For young readers curious about West, Enslow's Kanye West: Hip-Hop Star provides an interesting, accurate narrative about the performer's life and career. Author Gretchen Weicker's 48-page, Guided Reading Level "T" book features a reader-friendly design, fun sidebars, a timeline, and a list of rewards. Reading teachers and literacy coaches will find Enslow's free, downloadable teacher's guide for the title a useful resource. The guide contains curriculum-based activities, background about West, and a reproducible activity. The teacher's guide for Kanye West: Hip-Hop Star is available on the Enslow Classroom website. Enslow Classroom features paperback books suitable for supplemental classroom use and for classroom libraries. Each Enslow Classroom title includes a teacher's guide, reading level information, and in most cases, correlations to state and national curricular standards. The Kanye West biography is also available in a library-bound edition via http://www.enslow.com/. Now that the latest "Harry Potter" movie is out, it is amazing to see how Daniel Radcliffe, Emma Watson, and Rupert Grint have grown up (literally) in front of the camera. Daniel Radcliffe, a biography for those in grades 5 through 9, is available in both library and paperback editions from Enslow Publishers, Inc. Featuring quotes, personal stories, a timeline and a glossary, this title is great for reluctant readers. By now, we've all heard of Aron Ralston's amazing journey in the mountains. He was the man who went hiking in the rigorous Utah terrain and falls into a cavern where a boulder pins his arm against a rock wall. He only had one choice if he wanted to survive: to cut off his own right arm. A movie has just been released about Aron's story; 127 Hours, starring James Franco. Enslow has a great series out this fall called True Rescue Stories. Coincidentally, there seems to be so much news fitting this topic this fall (Chilean miners, etc. ); it really is such a topical subject. Before you go to see the latest Harry Potter movie, read Enslow's biography of J.K. Rowling. This biography starts with the bidding war for American rights for Harry Potter and the Philosopher's Stone. Geared toward middle school readers, this biography will be interesting reading for Harry Potter and J.K. Rowling fans. What is your favorite Beatles or John Lennon song? Everyone is excited that The Beatles are now finally on iTunes. You can buy all of The Beatles' backlogged songs for $150- which is a relatively good deal. This fall, Enslow published a book on John Lennon. What is your favorite Beatles or John Lennon song? Post your answers! The 147th anniversary of the Gettysburg Address will occur on Friday, November 19th. The National Park Service, which administers the Pennsylvania battlefield site, will hold an event to commemorate Abraham Lincoln's speech. Teachers and librarians planning Gettysburg Address anniversary activities are encouraged to use Enslow Publishers' The Battle of Gettysburg: Would You Lead the Fight? Author Elaine Landau's 48-page, Guided Reading Level "O" title weaves the historical facts of the three-day Civil War battle into a stimulating, accurate rendition of the battle's events. Landau adds extra engagement by creating scenarios in which she invites readers to speculate on what they might have done if they had been in the shoes of Gettysburg's key personalities. Landau uses this speculative approach in this book and the other five books in Enslow's American history series "What Would You Do?" Each title in this series is available in paperback as well as a library-bound edition. click on "What Would You Do?" click on the title in which you're interested. the teacher's guide will appear as a PDF under the image of the book cover. Help Enslow Publishers celebrate the launch of its classroom paperback brand – Enslow Classroom – at NCTE/Orlando! Enslow Classroom’s leveled, curriculum-aligned nonfiction books offer pre-K to grade 12 teachers new solutions to print-rich classroom needs! To introduce Enslow Classroom , we want to give NCTE participants a free Enslow book. How do you get your free book? Just bring this post to Booth 727 (near the Lounge). Not only will you receive your free book, but we’ll also give you an additional Enslow discount coupon! We look forward to meeting you at NCTE! I just saw something on tv about today being World Diabetes Day. Do your students need information about this disease? 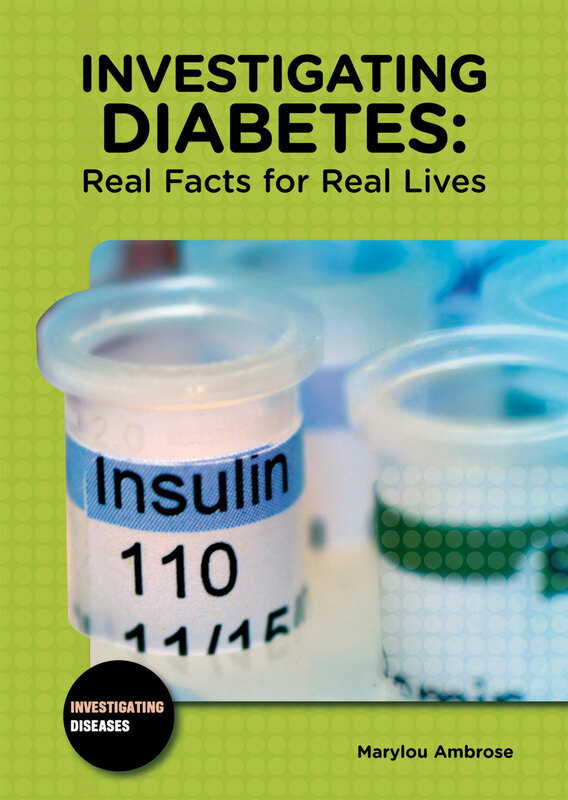 Teens will find a lot of information in Enslow's new Investigating Diabetes title. Middle school students will find information in The Diabetes Update. Have you seen this article by American Libraries Magazine? More than 1,800 libraries are celebrating National Gaming Day today. Libraries from every state in the U.S., as well as in Argentina, Canada, Finland, France, Germany, Italy, Pakistan, and Puerto Rico are participating. Organizers expect to easily break last years record of more than 31,000 people playing games on the same day. 195 years ago, Elizabeth Cady Stanton was born. She grew up to be a pioneer in women's rights. Who was Alger Hiss? Whittaker Chambers, who was an admitted ex-Communist spy, claimed that Alger Hiss was also a Communist spy. Mr. Hiss, who had been an assistant secretary of state in the State Department, denied this. Author Karen Alonso outlines the twists and turns of this fascinating case that became a symbol of the Cold War. Readers are encourage to form their own opinions. I was cleaning off my desk today and I uncovered one our of new titles, Plant and Animal Science Fair Projects, Revised and Expanded Using the Scientific Method by Kenneth G. Rainis from our Biology Science Projects Using the Scientific Method series. All of the books in this series provide exciting science fair project ideas and tips for science fair presentations using easy-to-obtain materials. For Grades 5–up, they are 160 pages and contain a list of suppliers, a further reading list, Internet addresses, and an index. The books in this series cost $25.95 each for schools and libraries, but today I'm giving my copy away for free! Help me clear my desk. Who wants it? Science fair season is just around the corner! Congratulations to Nicole, Enslow's Photo Manager, and her husband on the new adorable addition to their family. Lillian (Lilly) Jeanette was born November 4th and weighed 5 lbs 14 oz.. We look forward to meeting her in person but until then, this photo will have to do! Congratulations to Pam D for winning the baby pool! National Football League and New York Jet star LaDainian Tomlinson recently reached two career milestones that place him in among the game's greatest players. The running back has now rushed for over 13,000 yards and caught passes for more than 4,000 yards. The only other running back to have matched those thresholds was the late Walter Payton. In addition to their football accomplishments, Tomlinson and Payton were separately involved with charitable, off-field activities. For both players, their belief in "giving back" was matched by action. Enslow Publishers' biography of LaDainian Tomlinson discusses his philanthropic interests, and places them in the context of his exceptional professional career. Author Craig Ellenport's LaDainian Tomlinson: All-Pro On and Off the Field discusses Tomlinson's life, the positive influences on his character, and how he combines athletic success with off-field achievements. This high-interest, 128 page title is available in paperback from Enslow Classroom, as well as Enslow's traditional, library-bound edition. A free, downloadable teacher's guide is available for this Guided Reading Level "W" title. The album "Led Zeppelin IV," which included the song "Stairway to Heaven," was released. In 2007 the last three remaining members of the band performed in the Ahmet Tribute Concert a tribute concert dedicated to Ahmet Ertegun, the founder of Atlantic Records. Led Zeppelin owed their career to Atlantic Records. This concert was done by lottery, and the money raised went to the Ahmet Ertegun Education Fund, which provides scholarships to needy students in the United States, Great Britain, and Ertegun's home country, Turkey. Want to learn more and reminisce about Led Zeppelin? Click here. The Book It program is a great program to get children to read more. I actually remember doing this when I was in elementary school. Back then, we all got big buttons, and for every book we read, we got a sticker. Once our button had a certain amount of stickers, we got free pizza from Pizza Hut. It was a big hit in my class, and it still is! Enslow books are a great way to get children to read nonfiction. See www.enslow.com for lists of our titles. How are you celebrating National Young Readers Week? Let us know! One of the most famous women in the history of science, Marie and her husband, Pierre, conducted important research on radioactivity, which directly led to the couple's discovery of the elements radium and polonium. She was one of the first women in Europe to earn a doctorate degree, as well as the first woman to win the Nobel prize--an award she shared with both her husband and physicist Antoine Henri Becquerel, for her work on radioactive elements in 1903. She became the first person to win a second Nobel prize in a field of science when she was awarded the 1911 prize for her continuing work on isolating radioactive substances. Interested in learning more about Marie Curie? Click here. Who was James Naismith? He was the inventor of basketball! He was told to invent an indoor game, and had two weeks to create it. He wanted a fun and fast game, not wanting it to be risky, like football or rugby, and he didn't want it to be rough, so that the participants would get hurt. As a child, he used to play duck on a rock, which was the inspiration for his new creation of basketball. Want to learn more about duck on a rock and James Naismith? Click here. Can you guess which U.S. President proclaimed November as National American Indian Heritage month? Read the Proclamation here to find out. The National Register of Historic Places link has a list of American Indian properties featured in teaching and Historic Places Lesson Plans making it very convenient to bring a lesson into the classroom or library during November or any time of the year. Supplement that with our The Fascinating History of American Indians title and you're all set to go! On this day in 1889, North Dakota and South Dakota became the 39th and 40th states. Interested in learning more about North Dakota or South Dakota? Fun and Simple Midwestern State Crafts contains interesting facts about both states as well as the region. Learn how to create some fun crafts as well! Vote for Character Education with Enslow's "Molly the Great Respects the Flag"
November is filled with opportunities to proudly celebrate our nation, its character, and the responsibilities that come with freedom. Events such as Election Day, Veterans Day, and Thanksgiving offer ready-made contexts for teaching and learning activities related to these holidays. For young readers, a wonderful Enslow book that imaginatively addresses these issues is Molly the Great Repsects the Flag: A Book About Being A Good Citizen. Author Shelley Marshall's 24-page title provides a character driven narrative from which larger notions of citizenship emerge. The book’s Guided Reading Level "F" and lovely, watercolor-style illustrations invite readers to enjoy each page and absorb its message about civic responsibility. Molly the Great Respects the Flag also comes with a free, downloadable teacher’s guide, including curricular-based activities and a useful reproducible piece. The book, included in Enslow’s "Character Education with Super Ben and Molly the Great" series, is available in paperback for $6.95. The title is also available in a library-bound version. Visit www.enslowclassroom.com for more information and immediate ordering!